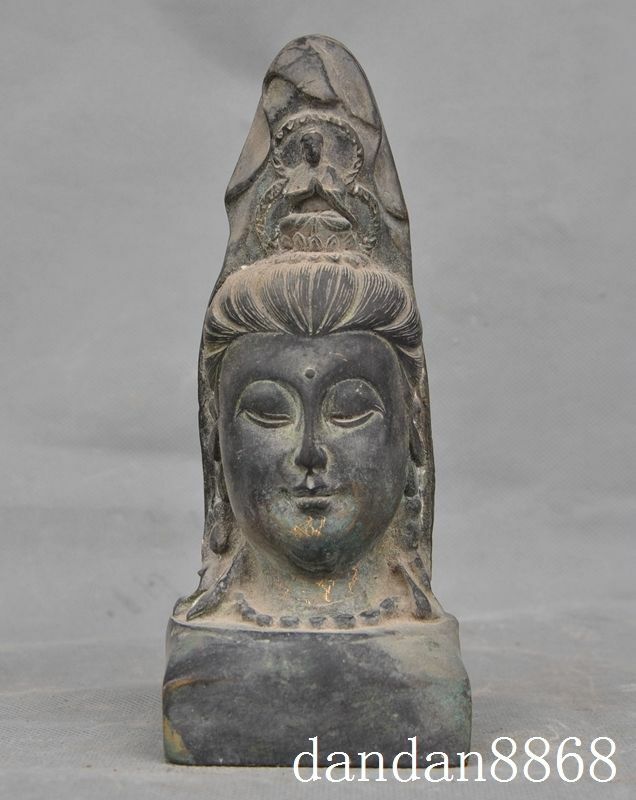 Avalokiteśvara is the bodhisattva who has made a great vow to assist sentient beings in times of difficulty and to postpone his own buddhahood until he has assisted every sentient being in achieving nirvana. They are known as “lord who gazes down (at the world)”. Though they may have started out male in India, they are typically perceived as being female throughout China and Tibet. The Lotus Sutra is the earliest known teaching of the docrines of Avalokiteśvara. 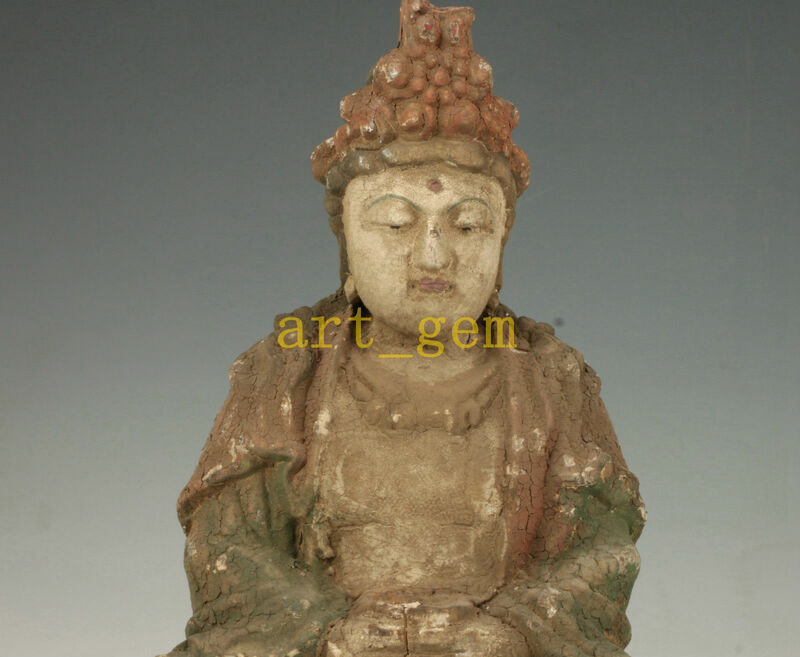 Kwanyin- 觀自在, also commonly spelled Guanyin in pigeon Chinese or Chenrézik on Chenrezig – སྤྱན་རས་གཟིགས། in Tibetan. She is known as the Goddess of Mercy and her name means “Perceiving the sounds (or Cries) of the World”. 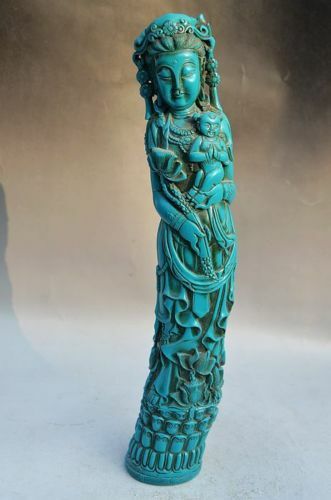 Considered to be a bodhisattva of the highest order, she is a form of Avalokiteśvara to many Chinese Buddhists as well as Tibetans. 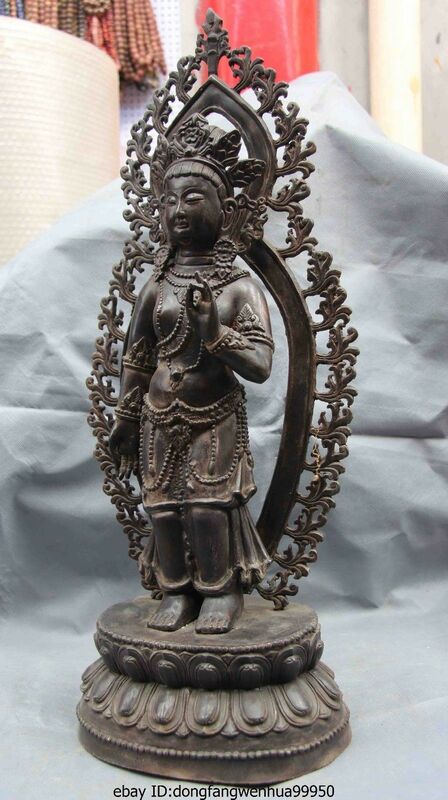 According to Tibetan buddhist beliefs, Tara came into being from a tear drop of Avalokiteśvara’s. She is known as the “mother of liberation”, and represents the virtues of success in work and achievements. Because these are all variations of Avalokitesara, they have all been included here. 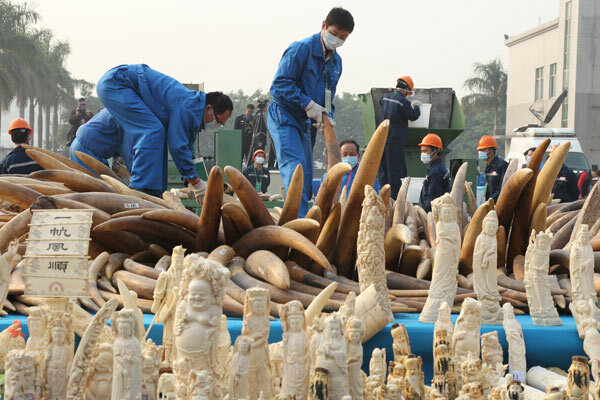 The Chinese put on a good show of burning “illegal” ivory in 2014, but if you notice, these carvings are almost all of religious icons, and mainly of Kwanyin. I’m sure she’s not a communist party favorite, nor an idol of the newly wealthy Chinese either. 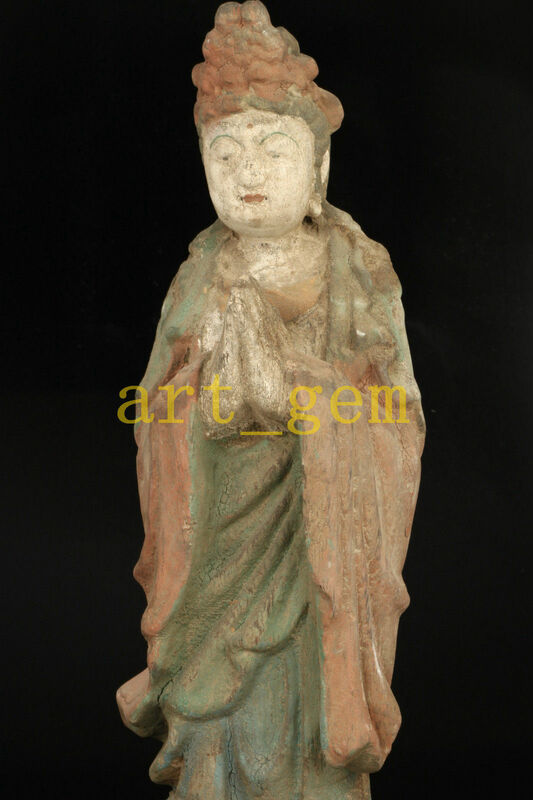 As far a religious idols or shrines go, she’s probably even more popular that Buddha himself in China, or at least right up there in numbers. 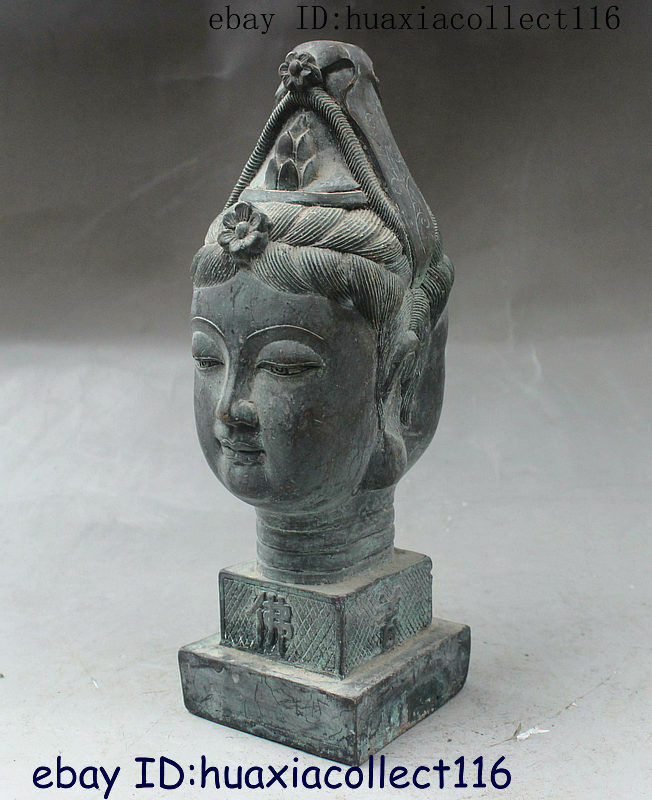 Sales tracked on Ebay for “Guanyin” from 2015 to 2017. 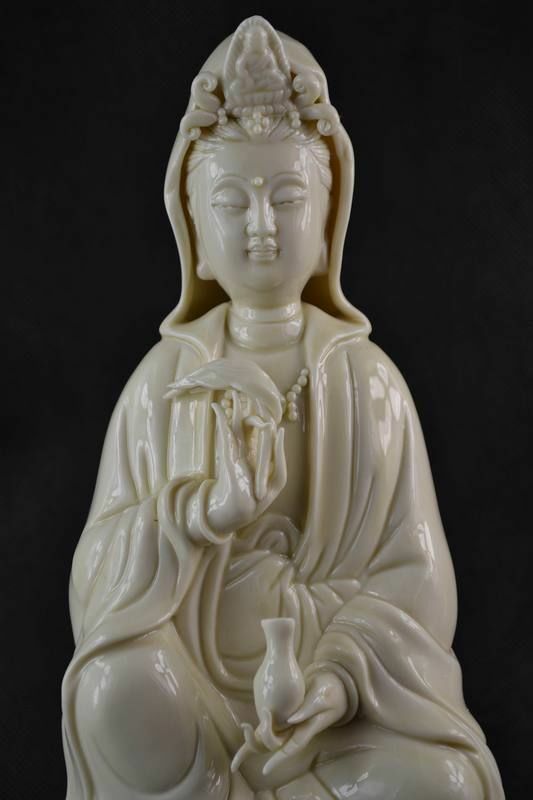 Sales tracked on Ebay for “Kwan Yin” from 2015 to 2017. 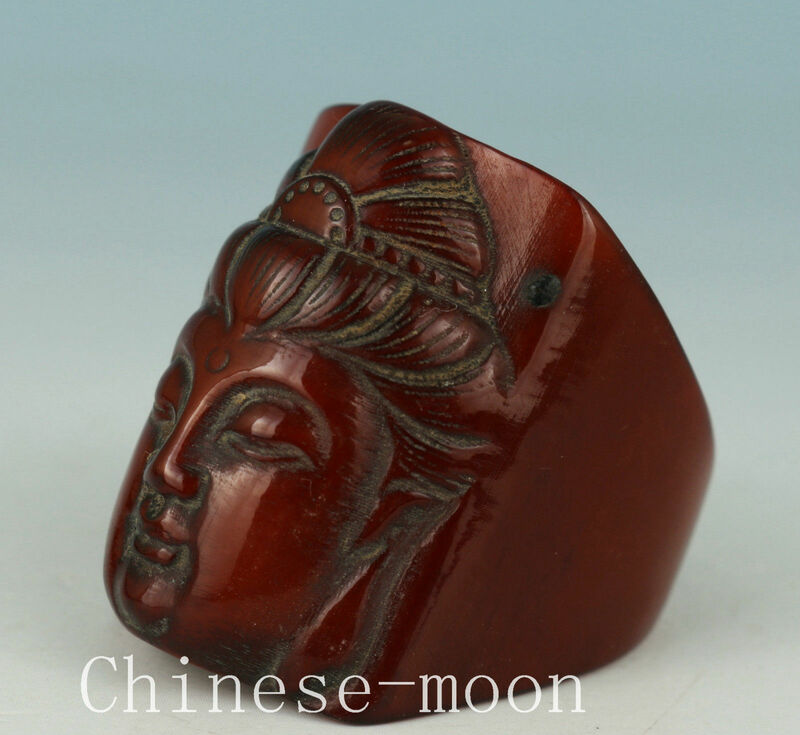 Search for “Chenrezig“- her Tibetan name- this is not to say there are less Tibetan shrines than there are Chinese shrines, but only that the name of choice that most sellers use is not the Tibetan name. Sales tracked on Ebay for “Chenrenzig” from 2015 to 2017. The noticeable dip in the end is Chinese New Year- the biggest celebration all year for many Chinese where they all go home to their families. and another piece of evidence that it isn’t Tibetans selling their own shrines- but the Chinese. 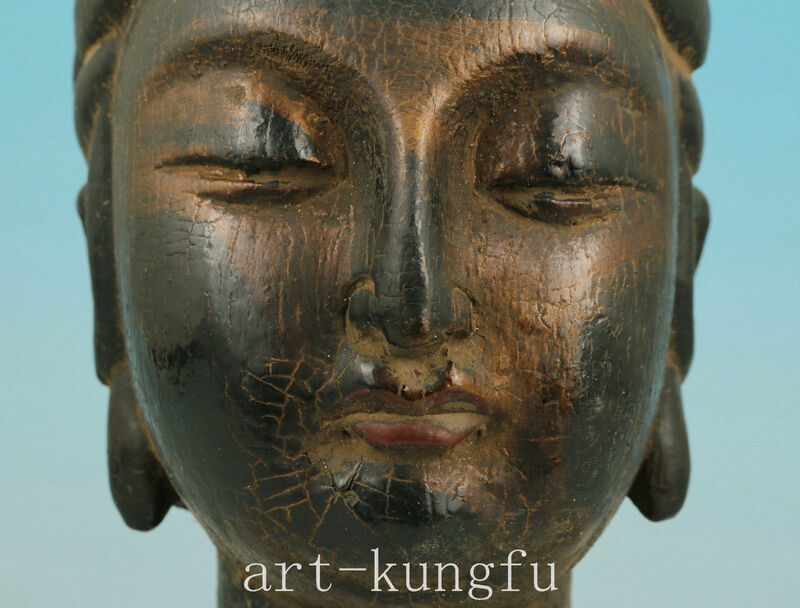 Although statues of Kwanyin in bone or ivory are fairly rare because most were apparently burned, there are statues made of every other kind of material known to mankind found in such prolific numbers, it really can only mean one thing. Most people don’t give up their religious shrines easily and it isn’t an item that people are likely to sell for quick cash. No, these were taken from someone, purposefully, and against the will of their rightful owners. Though this material is often sold as “alabaster” by sellers, the real alabaster- a form of calcite or gypsum- is quite white in color and can even be used for windows because of its translucent qualities. 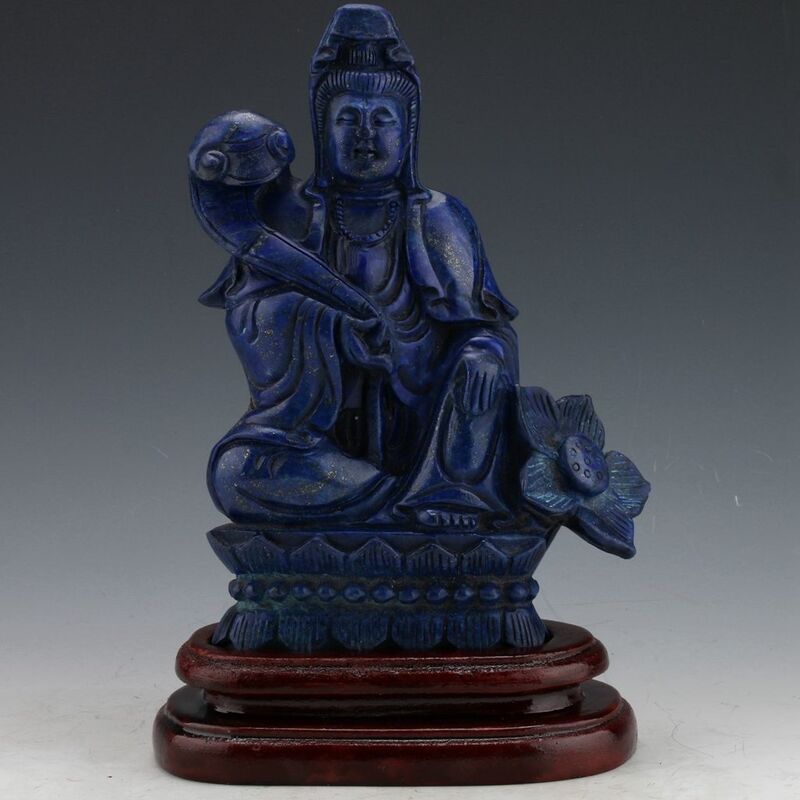 It is unknown if this truly is stone that they have often colored purposefully or if the color is from age, or if these are yet another form of resin that the Chinese have long been adept at producing. 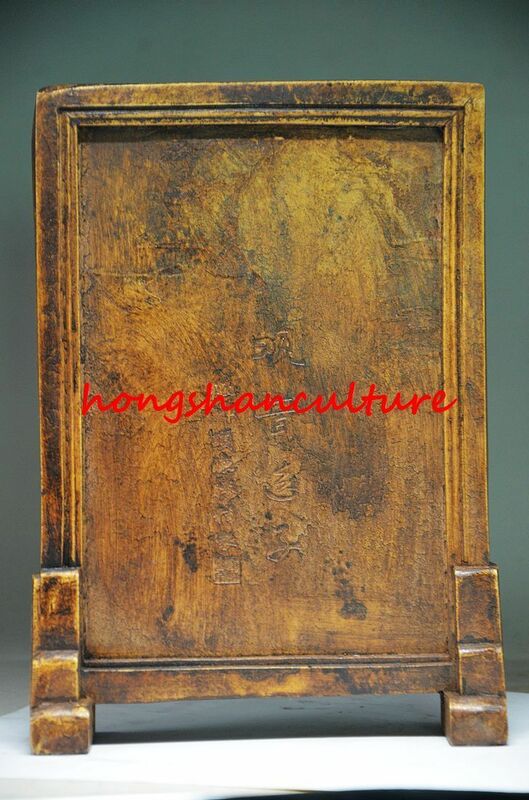 Photograph that has been double watermarked. I suppose this is slightly better than just using someone elses photograph with their watermark alone, but does go to show how much borrowing of photographs goes on between the dealers. Whole new levels here. Avalokiteśvara vowed never to rest until she had freed all sentient beings, but though they try as hard as they can, they realize that many unhappy beings were yet to be saved. 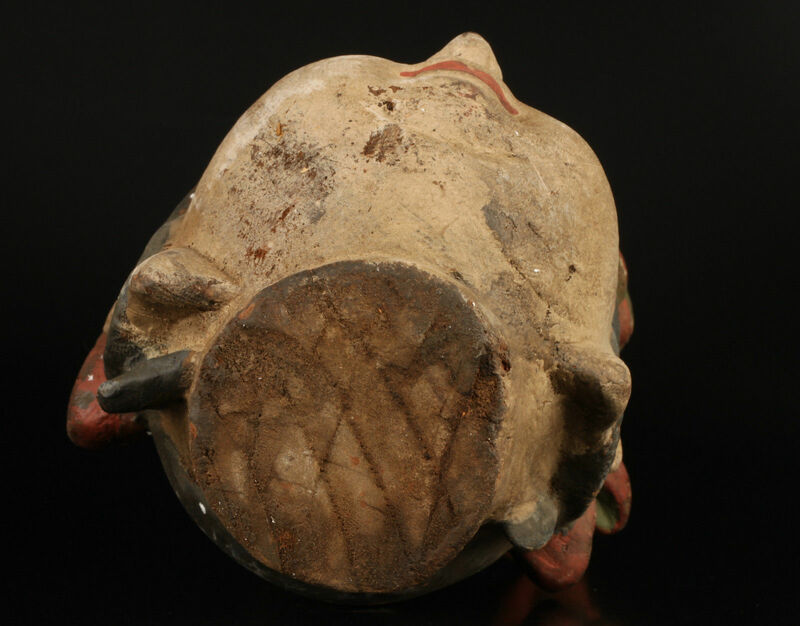 After struggling to comprehend the needs of so many, her head split into eleven pieces. After struggling to help so many, her two arms shatter. Amitābha sees their plight and gives them 11 heads to hear and see with- and 1,000 arms to help the suffering masses. 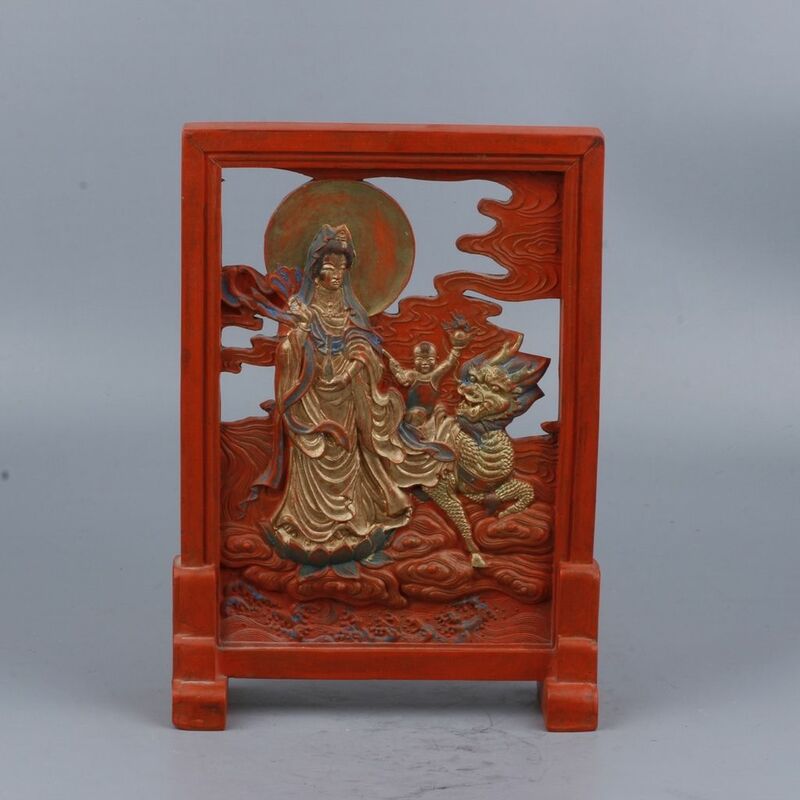 This screen- either 18th or 19th century of Kwanin with a child holding an ingot topped by a fireball and riding a kirin (also spelled as qilin) came in this alabaster finish, as well as a cinnabar. 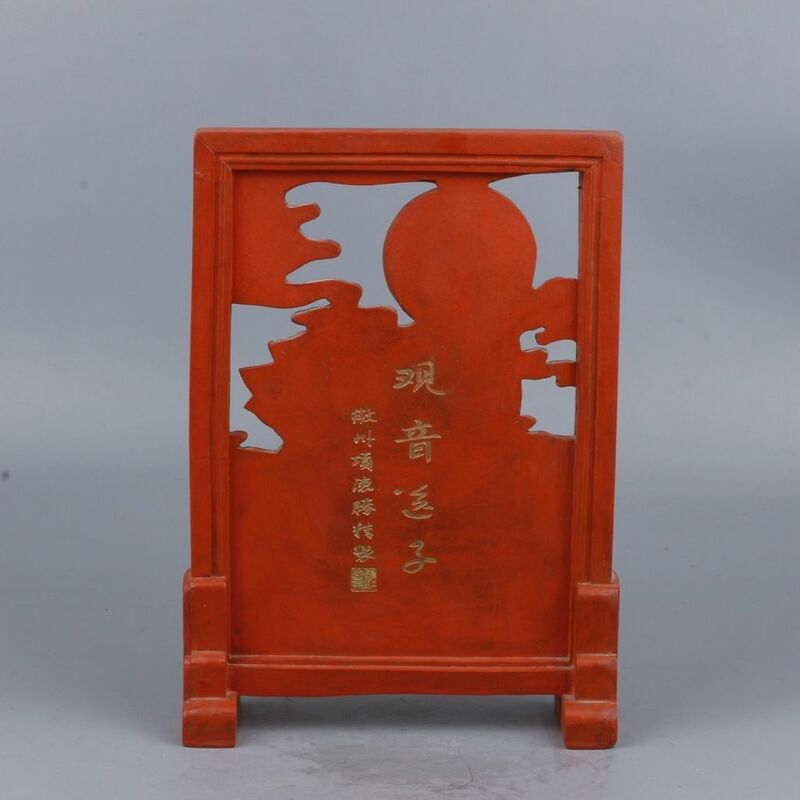 The cinnabar screen, though perhaps even toxic because of the mercury it contains (if it is cinnabar and not a resin), was probably the more expensive to purchase originally. 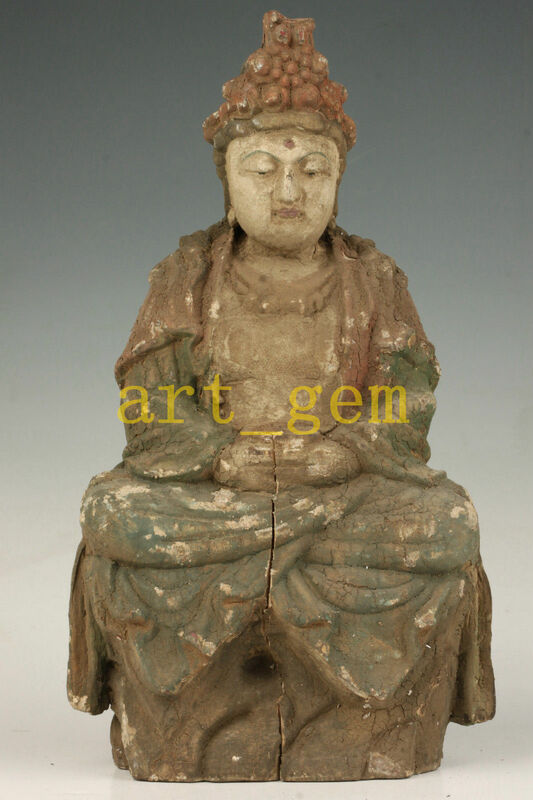 Many of the old statues and small carvings are made from a very hard wood called agarwood or eaglewood. An infection of a species of evergreen tree by a fungus is what gives it a dark color, and makes it more rare. 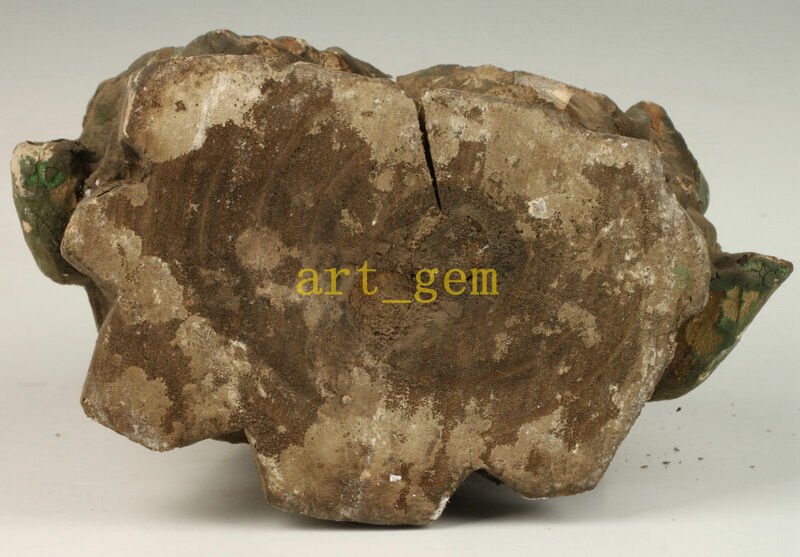 Aquilaria malaccensis is one of the 8 species of Aquilaria known to produce Agarwood and most widely used, is increasingly rare in the wild and listed as potentially threatened (Appendix II) by CITES today. Another wood commonly used for small carvings is boxwood- a very hard wood that is found growing throughout most of the world, but most commonly used for garden hedges. There are 17 species of Buxus in China, and 15 of them are endemic- meaning they grow nowhere else in the world except there. 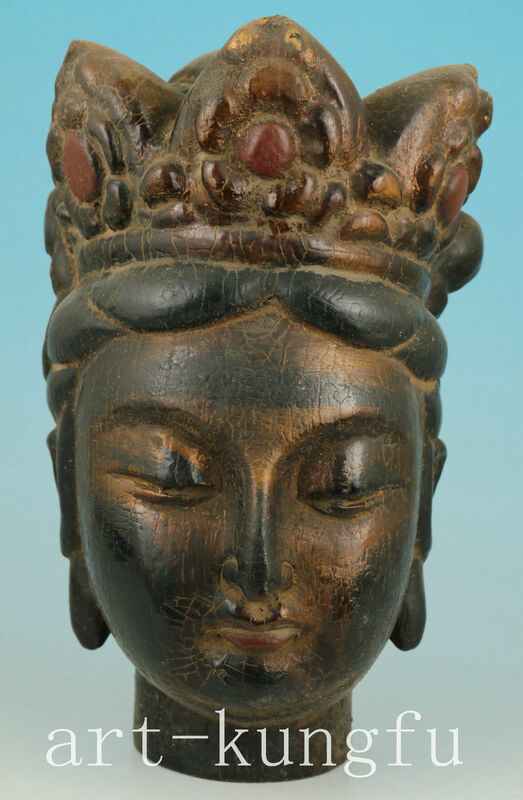 Early wooden heads of Guanyin. 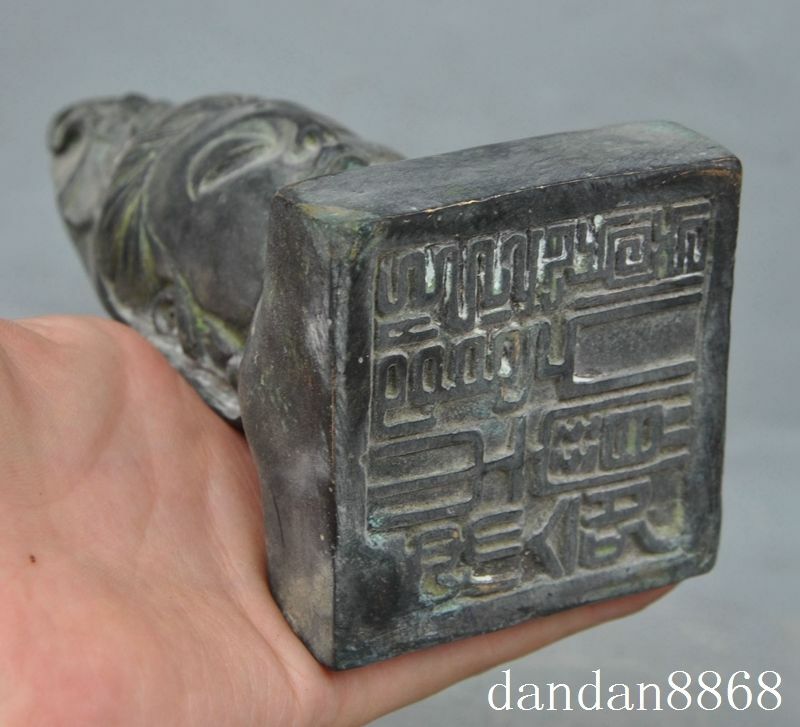 Not sure if they originally came from a full statue and the head is all that remains, but it is certainly easier to ship. 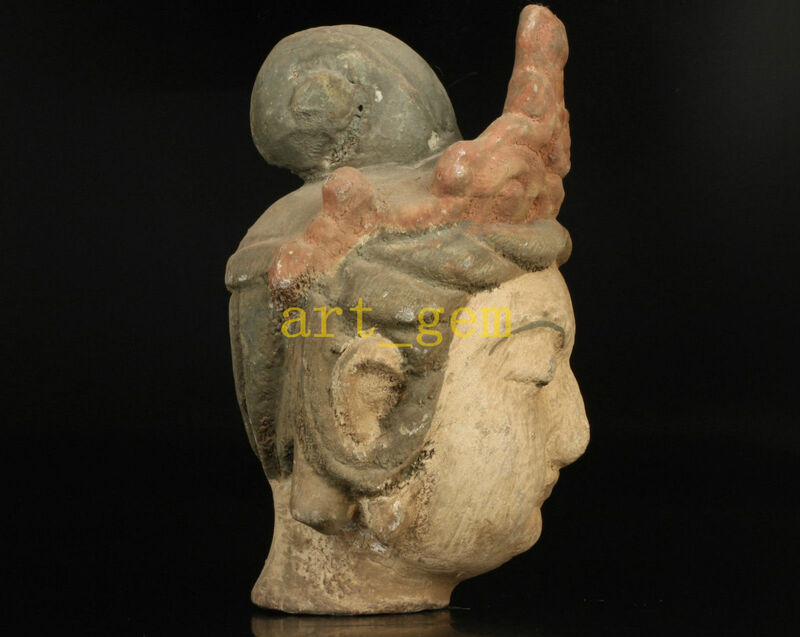 It is difficult to know sometimes who is who- I had thought the head below is of a very early Kwanyin with masculine features, but I could be incorrect, since the head above is definitely her and of a very similar age and style as the different character below. 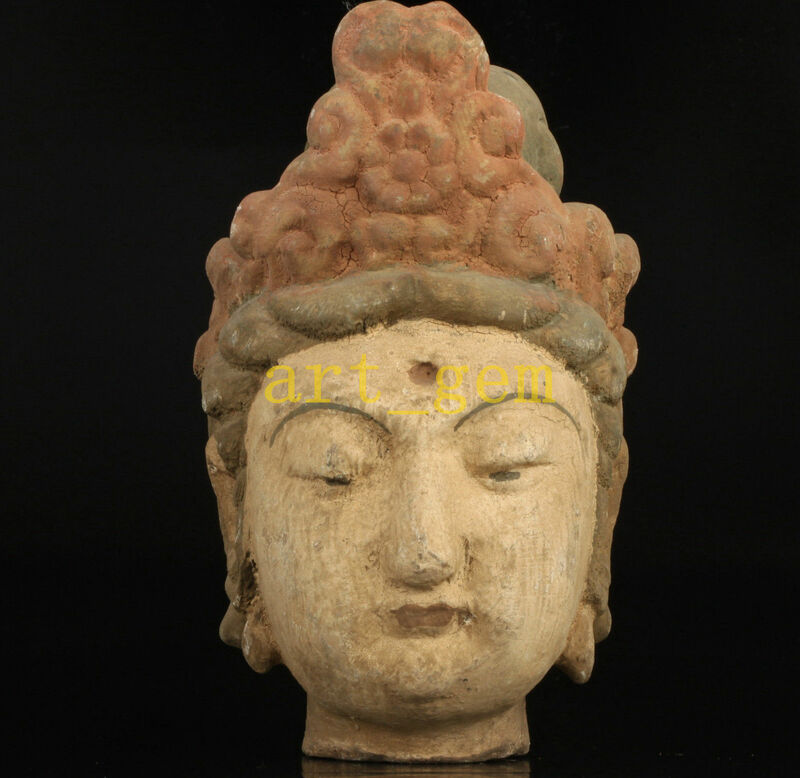 Perhaps all of these delicate wooden shrines, hundreds of years old at least, are from the Mogao Caves (also called the Dunhuang Caves) which was very dry and would have preserved artifacts like this. The vast majority of these caves were supposedly looted, but perhaps many of the artifacts never made it very far, at least until now. It is certain that they were probably preserved all together, or in very similar conditions, somewhere very dry and relatively undisturbed- Tibet is also very dry as well as NW China. Imitation turquoise (resin) carved in the classic shape of a elephant tusk. 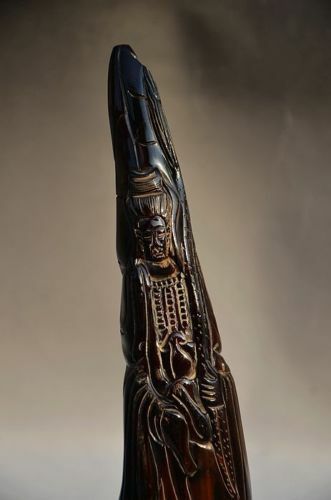 Another version of Kwanyin in the form of an elephant tusk, featured holding a lotus pod which is curling behind her ear and a shell on that ear, as if listening to the giant clam speak. Much of what is called “amber” may be synthetic or real amber mixed with additives such as colorants and perfumes (especially used in beads also called mila). 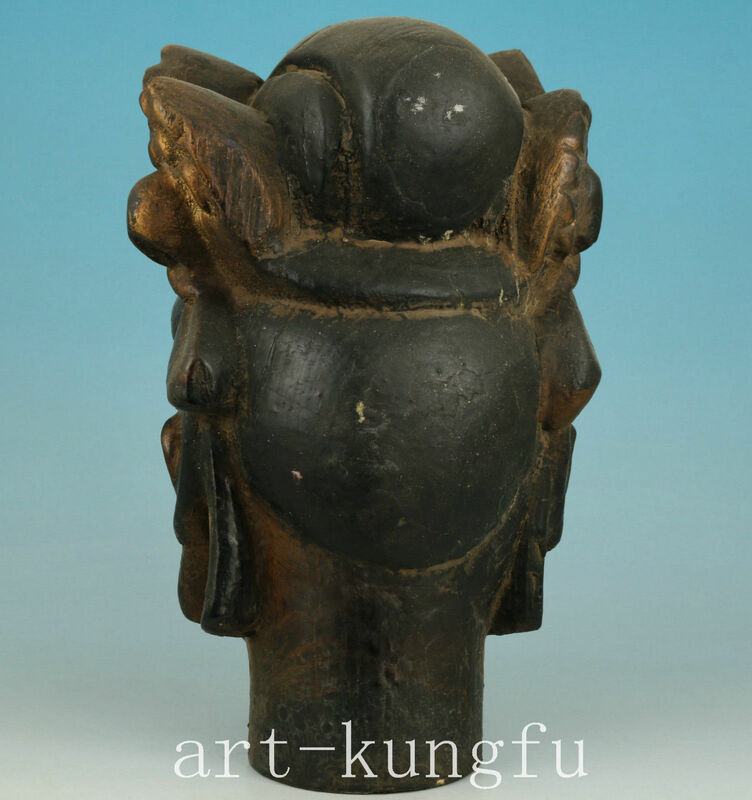 The seller states this huge statue of Kwanyin is made of “cattle bone” as well as the one below, however it could be a lot of things including ivory pieced together or oxen or yak. Considering the size of her and age (from at least the 19th century) it certainly is a steal at $875. The money might just barely cover the shipping costs, and assumably they are just trying to get rid of it. 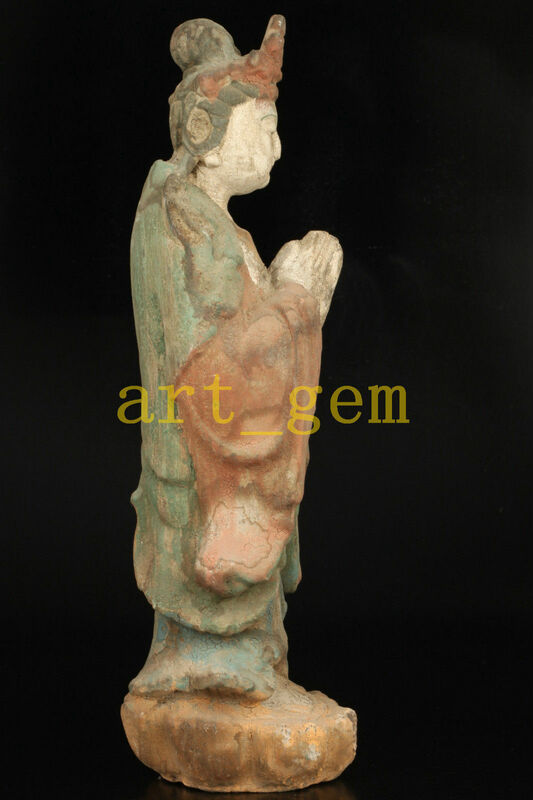 The seller states this is a “Huge~Nice Old Japanese Hand Carved cattle bone RuYi Kwan-yin On fish statue”, but again, the material could be a lot of things, and it is strange if it is Japanese- that it is being sold out of China as well as the very Chinese subject matter of Guanyin who is holding another very Chinese symbol- a ruyi- or ruling scepter. 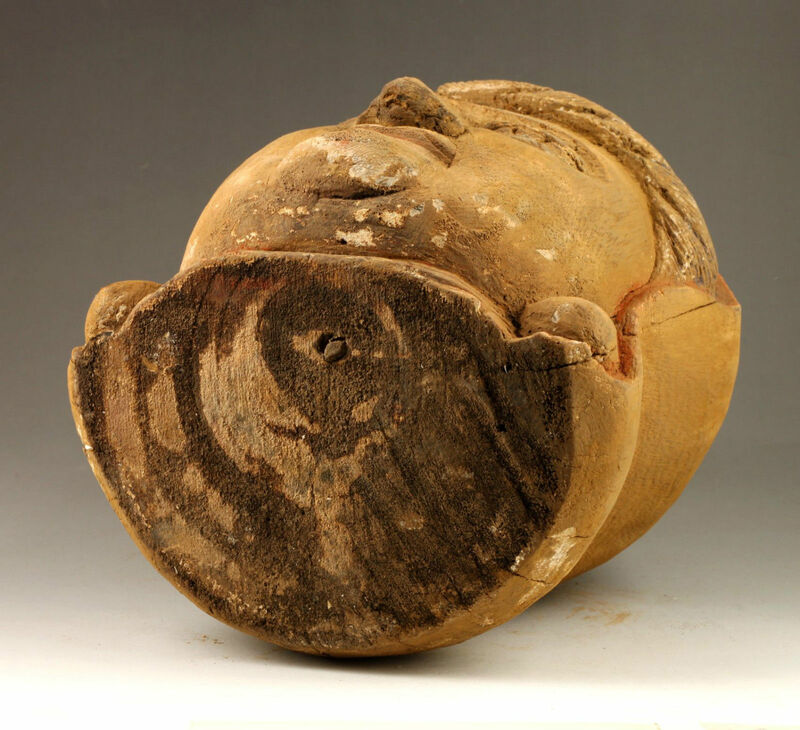 Another “cattle bone” sculpture below whose shape and contour fit a tusk perfectly. 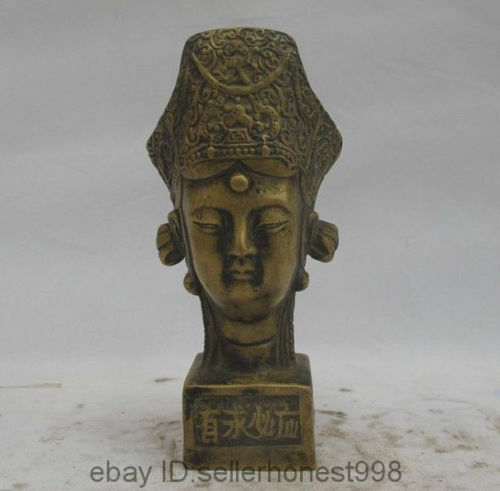 As often happens, the two Chinese shops above are ran by the exact same person (or family)- hence the reason they are using the exact same photos to sell it, have the matching pair of these hand carved shrines, and have placed them at exactly the same price. I’ve found that many, many Chinese dealers have multiple shops selling the exact same things, though it creates an illusion of a free market, in fact they are price setting and monopolizing the market if only one (or two) shop or family runs all the duplicates. Take from 10,000,0000 then give to 10? Part of the goal of socialism, of communism, is to redistribute wealth from the rich to everyone equally, but time and time again what I see occurring is a great number of people and families had their things taken, then these things ended up in the hands of very few to sell. Then the serious group of collectors who has the money to buy these things and knows what they are and worth is very small, and it tends to be people who are going to resell these items to also make a profit- thereby putting the wealth into the hands of even fewer. Instead of redistributing the wealth, China has actually pooled it among even fewer individuals. 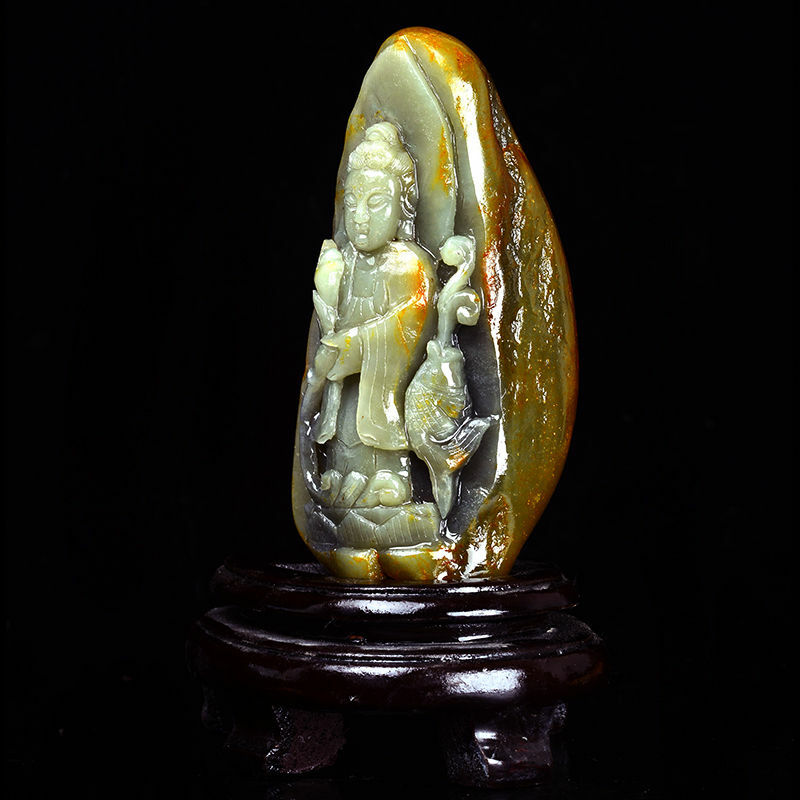 One of the most common pendant designs of Kwanyin is this one, smaller with her sitting on a lotus, holding a vase, and a round halo around her head- and one that might have been easily affordable to the vast majority of the population. 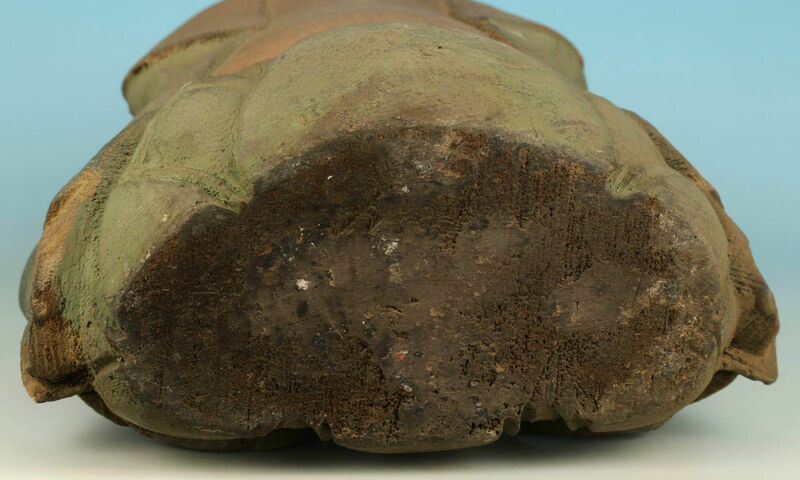 This is a particularly loved example, and may have came directly from a grave with the amount of dirt on it and fine sand. 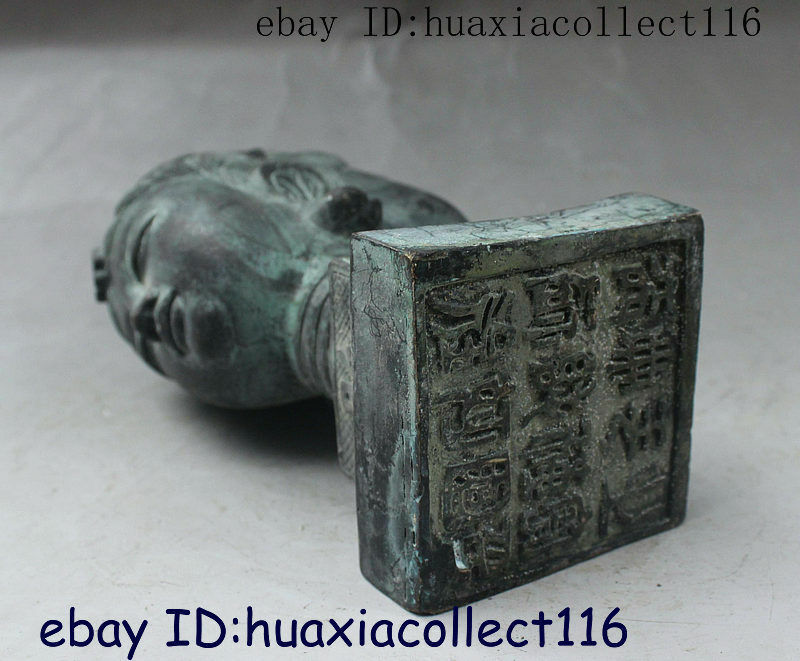 Both the examples above and below are probably not real jade, but fake and an good example of where much of the bulk of the goods- used and being lied about- is coming from. It is not the rich and the well-to-do in most cases, but the poor, who didn’t have much to begin with. 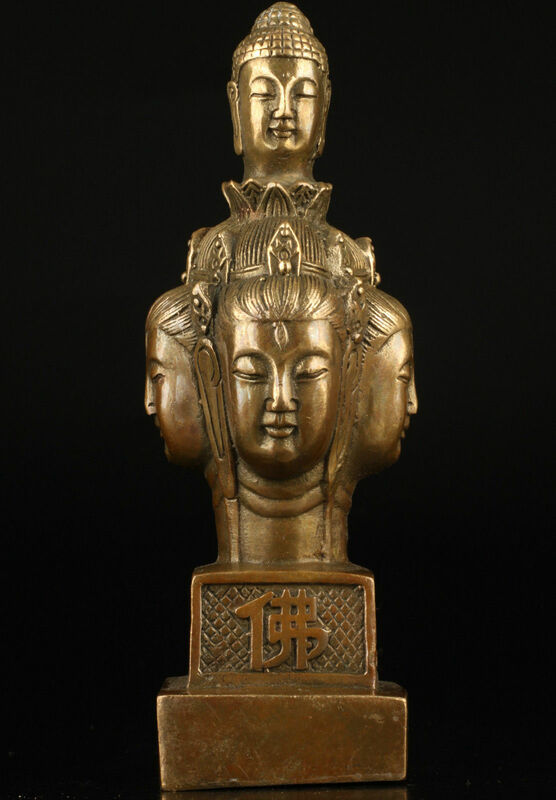 Kwanyin seen here with another pendant of the same time period- Laughing Buddha or Budai. 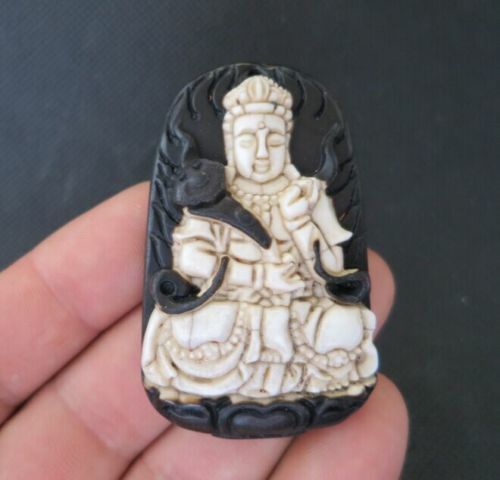 This obviously used, and vintage if not antique pendant of Guanyin was being sold time and again as brand new. 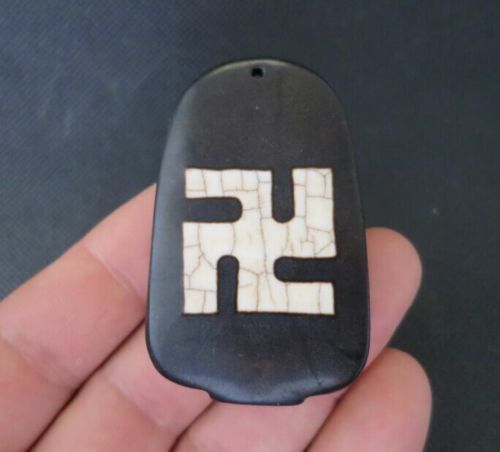 Yet another used religious pendant being sold as brand new. See chipping on edges as well as wear to face and dirt. 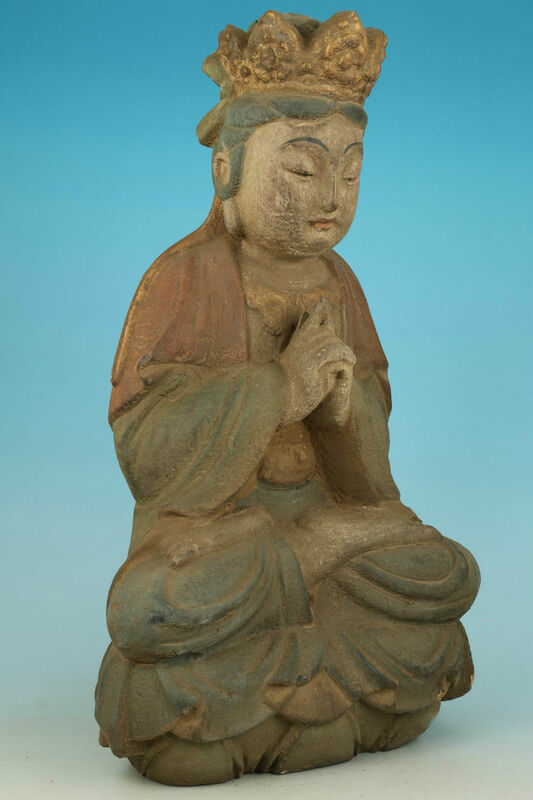 Kwanyin’s two most common poses are holding a flower or holding a vase. 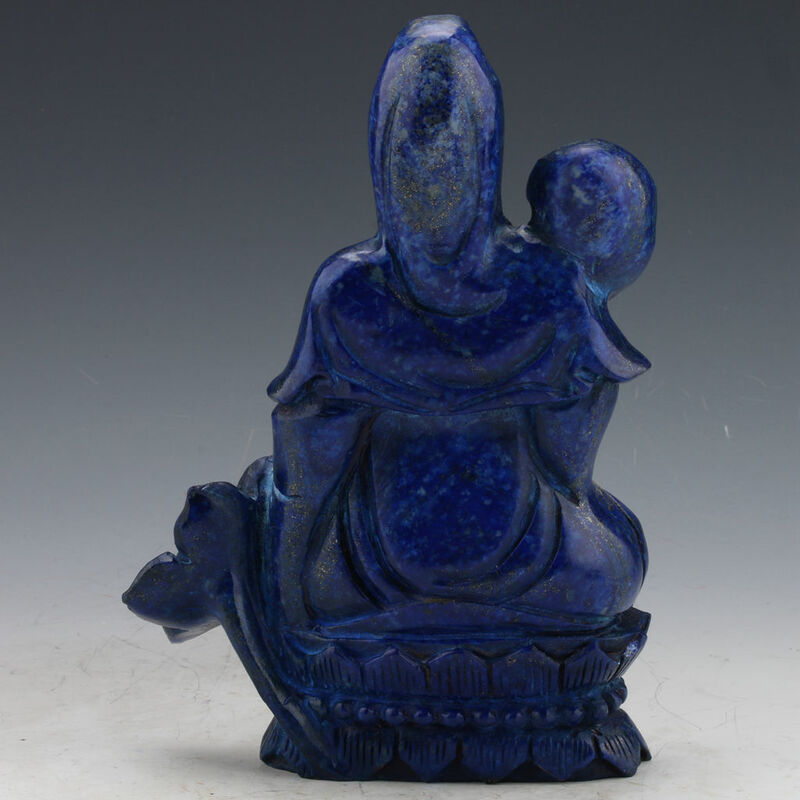 Here in this early depiction carved from lapis lazuli above, she’s/he’s seen with flowers and a vase and a branch of ruyi. By looking closely at the pendant above and the fine bits of gravel in the cracks, you can be sure of where the Chinese part of the stockpile of fine jade they’ve put up for sale. Desecration of people- countless generations of them- and religious icons really don’t get any better or bigger that this. Right up there with drying your underwear on religious shrines. 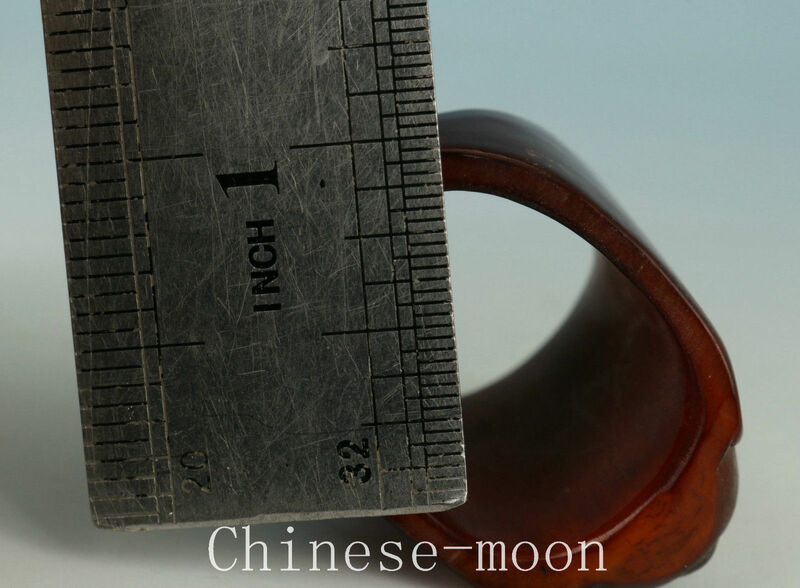 Dehua porcelain is a type of fine white Chinese porcelain known from Dehua in the Fujian Province (so these probably came from well-to-do Chinese families, not Tibetans, though there could have been some trade), it has been produced since the 12th century up to modern times. Of the finest and whitest clay particles in the world it is made out of, with the glaze typically being translucent so that these qualities in the clay aren’t covered up. Long have I suspected that in addiction to price setting, monopolies, and outright stealing of goods for sale from oppressed minorities, that the Chinese may also have some “price setters”. These people are either the sellers themselves or people hired by the Communists to keep prices artificially higher by bidding against other bidders. I also suspect they may also bid against legitimate bidders when the price is set too low and they just don’t want to sell the item for next to the minimum price. 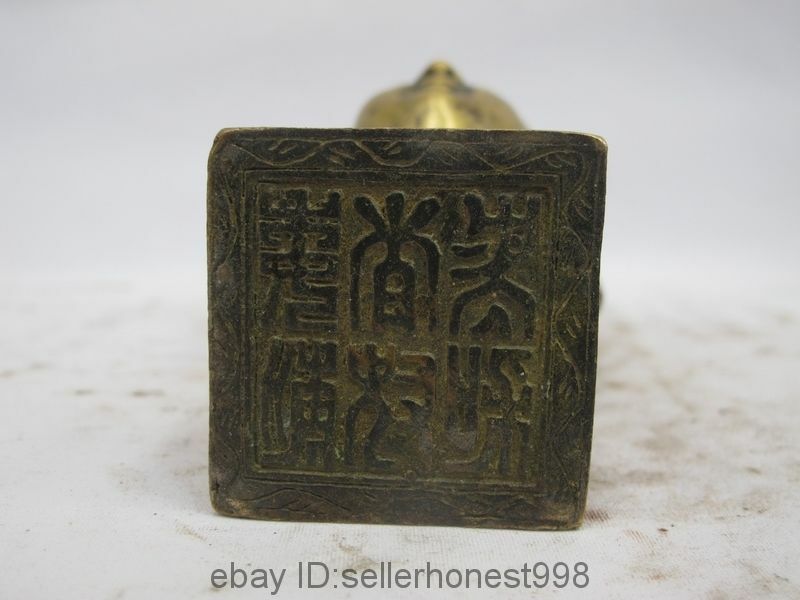 In addiction to these other ways of cheating the Ebay system, I also suspect that sometimes if you win an item at a very low price, they just don’t send it. Then it is up to you to say something and try to get your money back. And they say it was “lost” in the mail, but maybe they just didn’t send it to begin with, then try selling it later to see if they can get more for it. The other scam that they also may do is to not send expensive items purposefully, especially if sold at a very low price, just say it was lost and reimburse the bidder, then they are able to take it out of their inventory which is checked by the Communist Party (since they supply it) and sell the items under the table in the Chinese black market for way more than the couple bucks it cost them to reimburse the international Ebay buyer for the item. Just saying. There is a sense of utter lawlessness and absence of morality in the business dealing of the Chinese, and I certainly wouldn’t put it past them to be up to all kinds of unfair things. 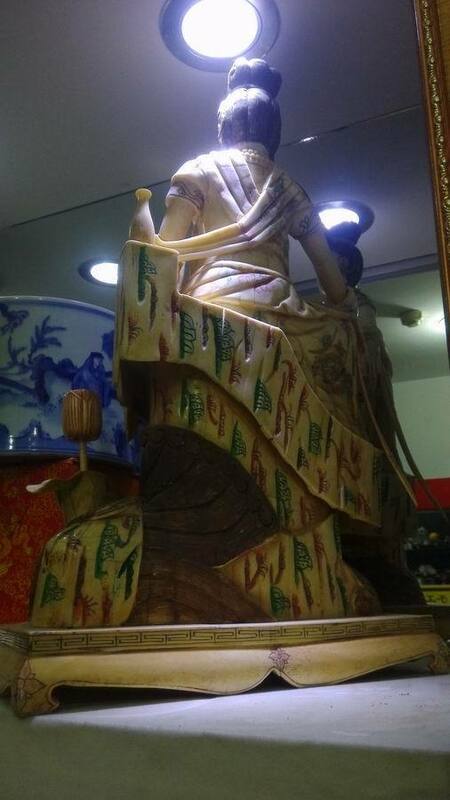 Wu Zetian? Is that you? 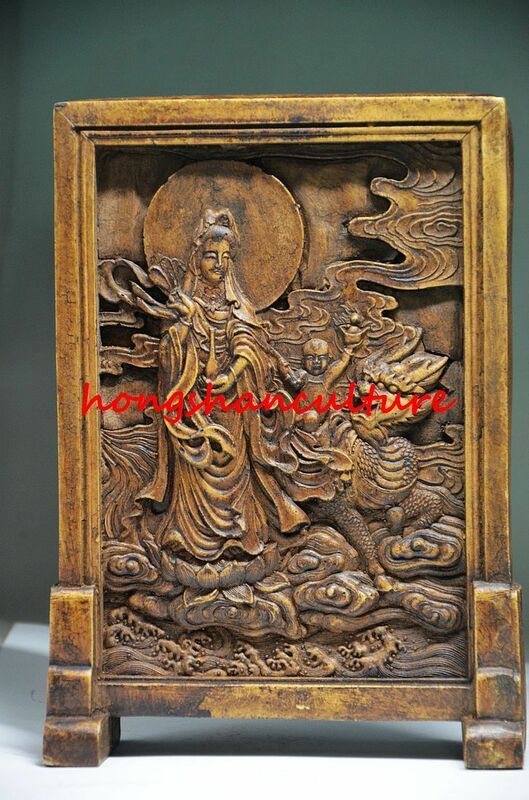 Where does Guanyin come from- this female embodiment of Avalokitesvara? 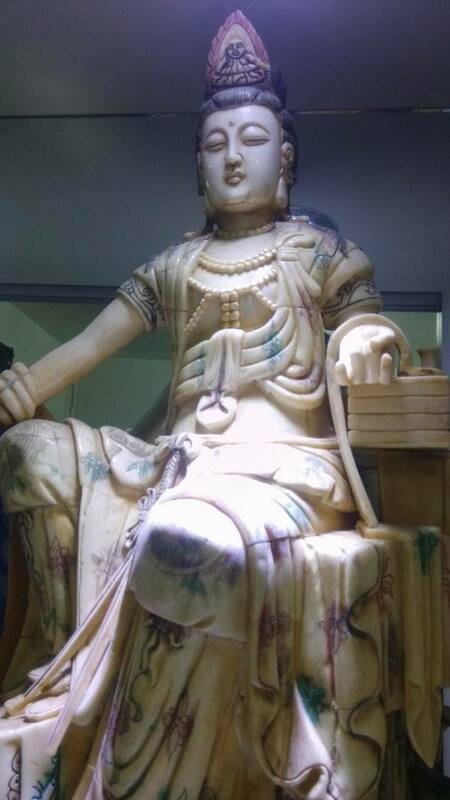 Wu Zetian, one of China’s most influential empresses lived from 624-705, and during her reign created monuments and temples to Buddhism throughout China, including the Buddha statue below modeled after herself at the Longmen Grottos in Henan Province. 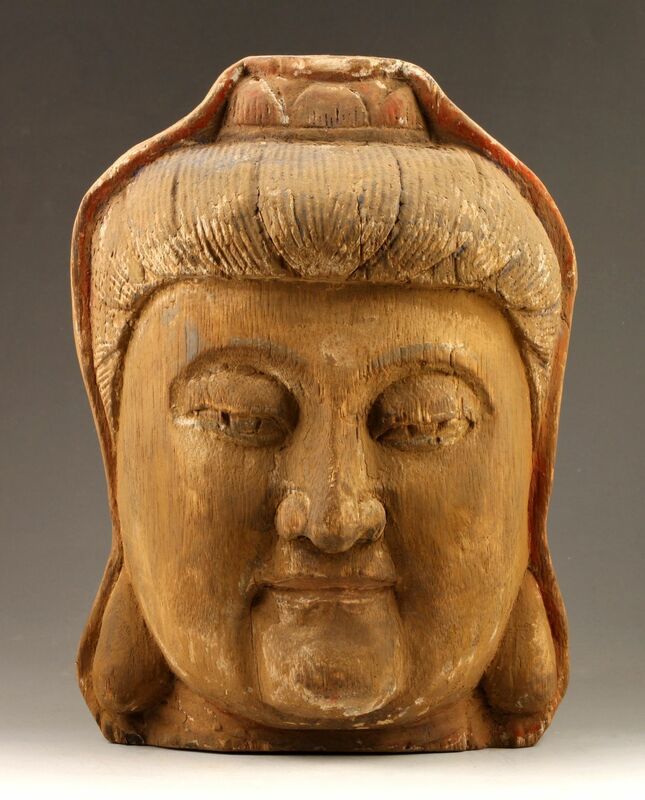 After her reign, Avalokiteśvara – becomes more and more female in depictions, and particularly after the Song Dynasty which came afterward- in which her original story and character may have been forgotten about by that time and embellished upon. Nothing like absence to make the heart grow fonder- this apparently is what happened in Buddha’s case, as well as Jesus’ and to Wu Zetian as well? 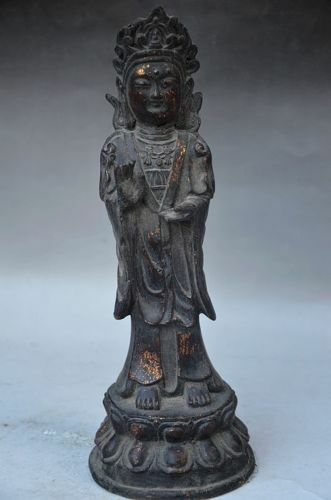 The figure above, very old, may have been made from metal from meteorites- long believed to be powerful and sacred in its own right. It probably was kept in a special gau (shrine) box. 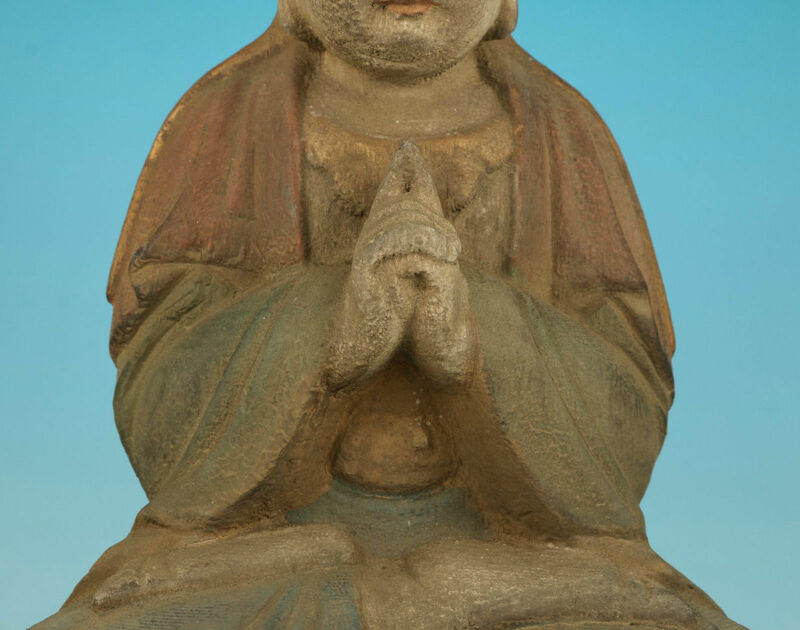 In this version Kwanyin has obviously been plucked straight from the grave with the amount of dirt still attached. One of my favorite depictions of Chenrezig (or Tara?) riding a goose seen above. I’m still confused between my Tara’s and my Chenrezig’s and feel this probably is ?? I wish I had a Tibetan to consult with really. She rides a goose- which of course makes her awesome no matter what- and is the female embodiment of Avalokiteshvara either way. Find out more about the spiritual significance of a swan or goose here. 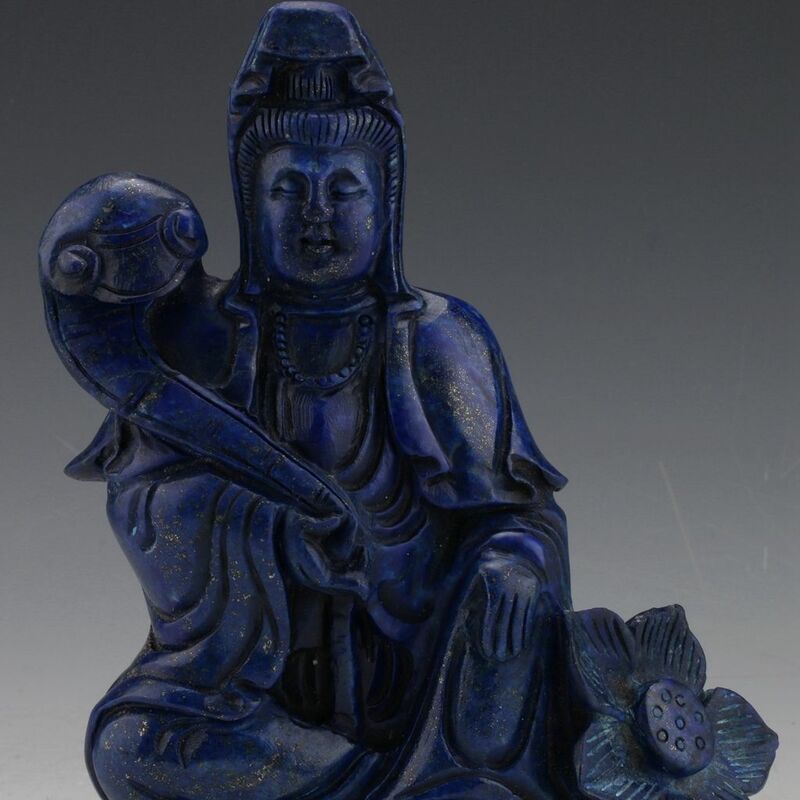 Cloisonné – the enamel work done on the statue above to give it color is a very Chinese art form, while mosaics made entirely of cut stones like below are typically Tibetan. 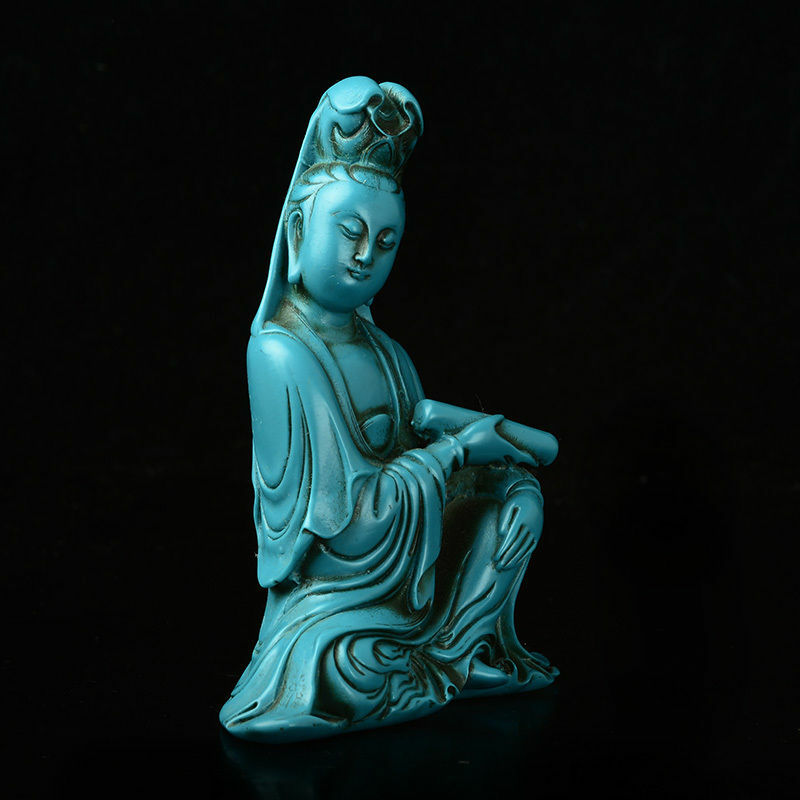 In ancient times the Chinese also did turquoise mosaics, but became much more refined as time went on and diversified into more technical and elaborate techniques, while the Tibetan style has stayed true to its roots, and still incorporates cabochon stones which are one of the earliest forms of preparing gemstones- as opposed to cutting facets which came much later. 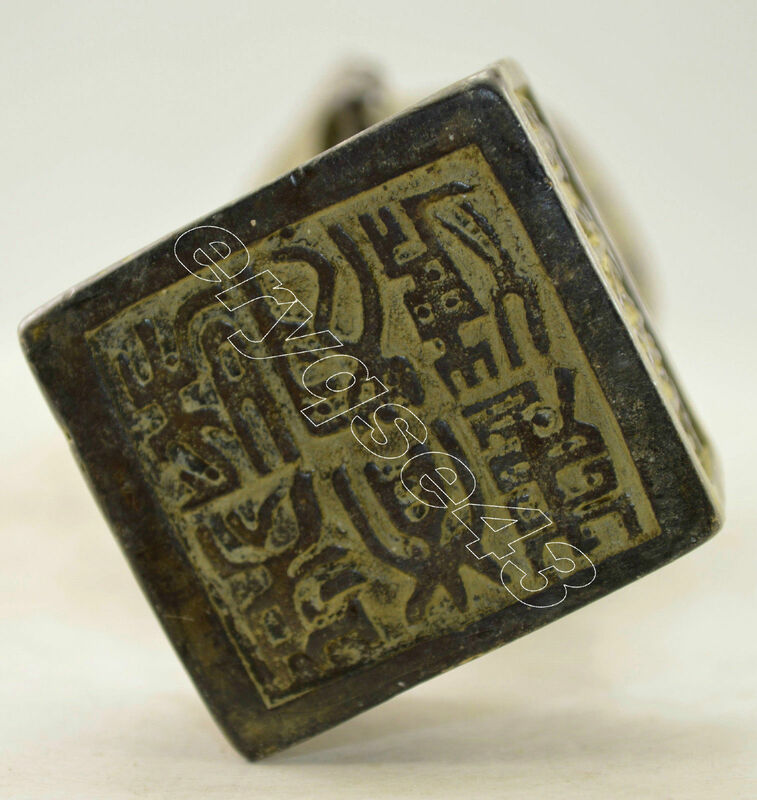 Seals are used to officiate documents as well as sign paintings and art. 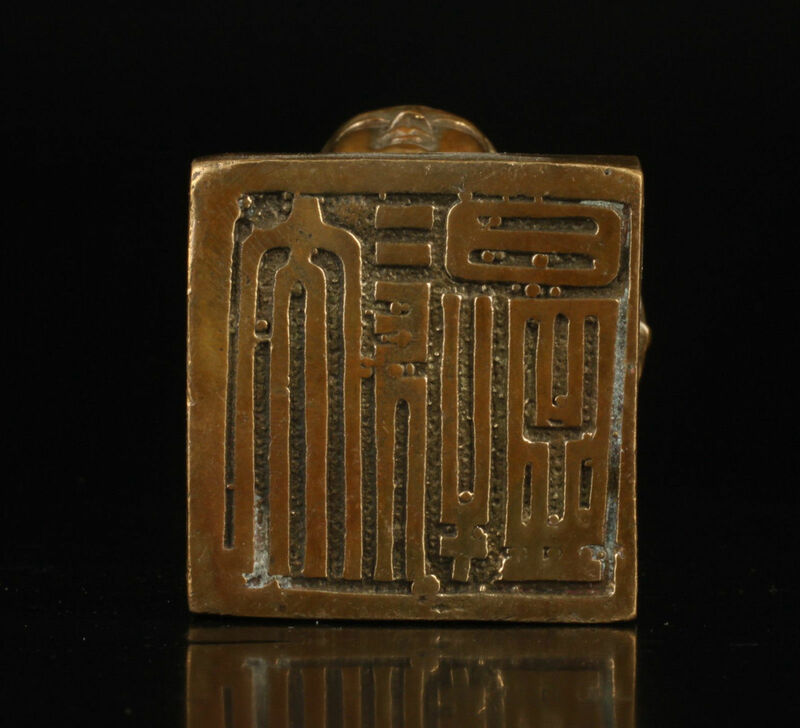 Because these are religious seals they may have been owned previously by monks and monasteries and/or placed in the stupas of prestigious monks to officiate in the afterlife. 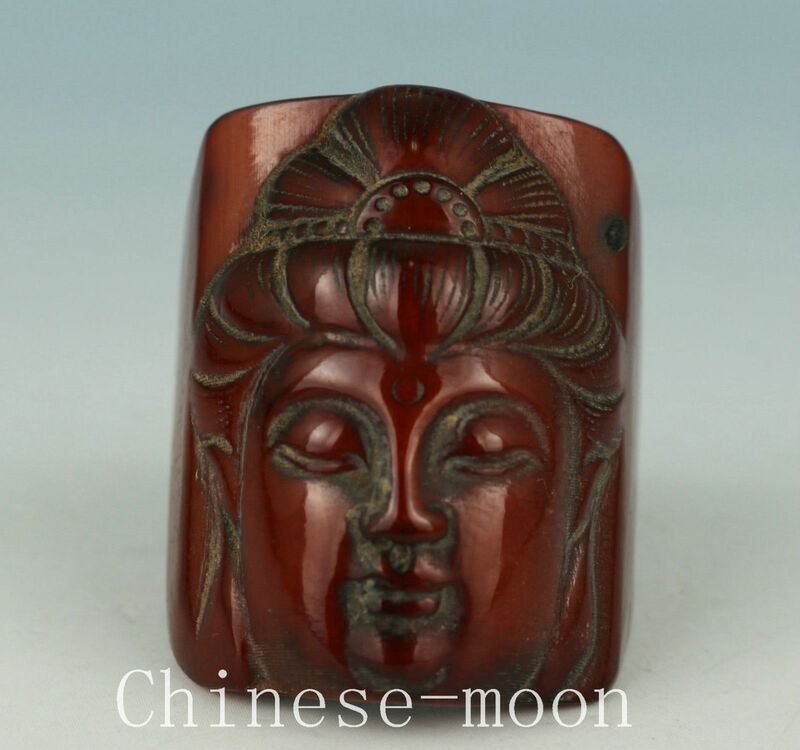 This is a common Kwanyin seal that comes in various colors of metal and age. They were not produced all at one time or even by one person, but cast again and again, copying an old design or slightly embellishing upon it. Above you can see left over bits of metal in the seal design, typically left over from lost wax casting (called spruing or sprue).